Our clients see better results when they have periodic visits with one of our doctors. Clients who complete Dr. Urshan’s Health and Weight Loss Center’s program typically enjoy more gratifying long-term results than those people who try to lose weight alone**. Physician weight loss includes a personalized weight management plan that is backed by facts, instead of a calorie-counting diet fad. Following our program gives you some important health benefits like increased energy levels, elimination of sleep apnea problems and the regulation of blood pressure**. Our program determines the root causes of your weight gain, hormonal and genetic factors, low metabolism and diet. In addition to a detailed diet plan, our patients will receive nutritional and behavioral counseling, regular health evaluations and a thorough physical exam. Customized, unique weight loss plans will help you avoid pulmonary, cardiovascular and skeletal stress**. 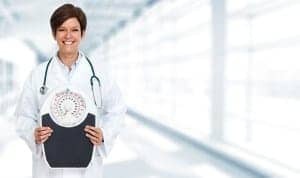 If you live in St. Petersburg, Clearwater, Palm Harbor or surrounding cities and are in search of a physician weight loss program, contact us today. When done healthily, you can alter your lifestyle, eat healthier foods, improve your exercise routines and be happier**.